I love barbecuing our meals in the summer months. Traditionally, we think of grilling chicken and beef, but I’ve also found I have a huge craving for grilled shrimp. Shrimp has been one of my favourite foods since I was a child. I remember in grade 5 I did a writing exercise where we had to describe our favourite food. I wrote about my love of shrimp. I guess not much has changed because all these years later, I’ll never turn away a chance to eat a delicious shrimp dish. If you haven’t tried grilled shrimp yet, you need to! It’s delicious. And as I’ve discovered, the Internet has opened up my world to a whole new culinary experience. My mouth is watering just browsing through these recipes and the photos of the meals. They all look so good! If you don’t have a barbecue, try shrimp on an indoor grill. I didn’t have a barbecue for awhile so I had to use an indoor grill and shrimp are delicious cooked this way too. What is your favourite recipe for grilled shrimp? Lovely recipes! I’ll check out foodie.com! These are great recipes, they all look yummy, I’d love to try the Citrus-Apple Butter Glazed Shrimp. Thank you for sharing this recipe post. I love shrimp and grilled on the BBQ is my favourite! I will have to try some of these on the barbecue. I love anything grilled, but especially shrimp! Oh man I love shrimp! The sweet and smoky shrimp is going on my menu plan for next week! Wonderful! Mouthwatering goodness! 😀 I love shrimp too! Thank you! Grilled Shrimp Thai Salad!!! I want to try this. I LOVE shrimp and am always looking for new shrimp ideas!! I can’t wait to try the Sweet and Smokey Glazed Shrimp, they look so good!!! I love grilled shrimp. I am a shrimp girl, too. Fried and grilled are amazing. I admit I’ve never tried to grill it myself. I will have to check out the recipes. The herb grilled and spicy ones look wonderful. I am saving these delidious recipes in my favorites file for future reference.I love shrimp and I am going to try the herb and lemon one first because its making my mouth water. Thanks for all the great ideas! Mouth watering!! I have got to make the Shrimp Tacos with Pineapple Salsa! Mmmm….these all look so good! Especially the Grilled Shrimp Thai Salad. Thanks for sharing! I love shrimp! These recipes look great! I like grilling shrimp but I also love them in a stir fry with veggies and a sauce served on rice. I too am a lover of shrimp. However the only grill I have is my George Foreman, (because I live in a condo and can’t have a BBQ). It doesn’t pack quite the same punch. Shrimp Tacos with Pineapple Salsa sounds good. Maybe mango instead of pineapple. 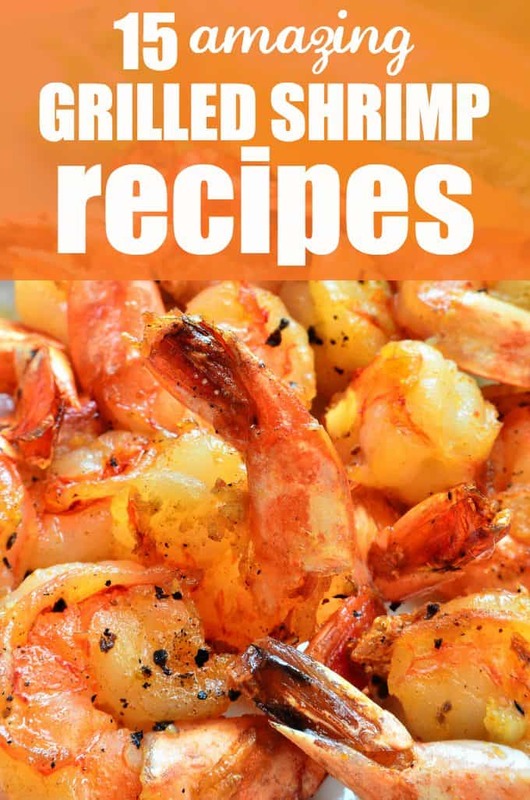 I have never grilled shrimp , will have to try one or 10 of these great recipes! These all look so good, yummy! I love shrimp and the best I ever tasted were just plain cooked shrimp bought at the harbour in Sydney, along with fresh bread rolls. My friend brought butter, plates, knives and forks etc and yes even a bottle of wine. We enjoyed this picnic down in one of the numerous bays. Seventh heaven and tasted sooooo good. I have a son who is autistic and he is PICKY. But he loves shrimp so these would be great to try.